We all want a dog we can take everywhere. A friendly, easygoing, well-behaved pooch that can come along on visits to a friend’s house or to the park for a ballgame. Instead we end up worrying. We worry about jumping, leash-pulling, barking, and kids being chased. We worry about coffee tables knocked over and toddlers laid low by tail wagging. We worry about growling or, worse, biting. It doesn’t have to be that way. Your dog is part of the family and should be a natural companion wherever you go. That’s where we come into the picture. At Dogs Among Us®, we help you train your dog to behave well in the real world—not just in the classroom. 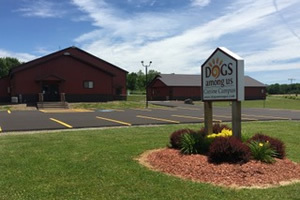 We are an Oswego, NY, dog training business offering private dog training lessons, puppy kindergarten training classes, and dog & baby guidance for expecting parents. We can even train your dog for you. 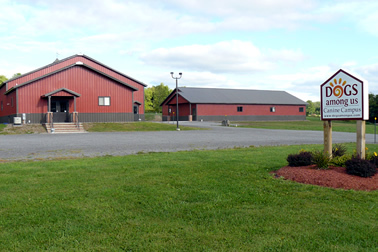 Call 315.341.8763 or contact us today to start training your dog to be an anywhere, everywhere dog! “We had been through 4 other trainers with our lab/Dane mix who would fearfully bark when surprised. 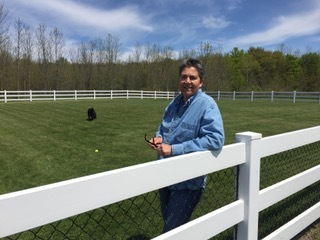 We had had many different experiences with the various trainers, but had not been given any tools to actually help… Andrea noticed the strengths in our relationship with our dog and built on those strengths to give us the tools we needed. …I can’t speak highly enough of all of these classes!